I was born and bred in the Black Country (to the uninitiated, that’s in the English Midlands, which with Birmingham was the industrial revolution’s ‘workshop of the world’). After spending too many years living in the big bad city that is London I moved last year to Hastings, a very nice town on the south coast. The books in my Hollow Moon series are tales of space-opera mystery and adventure for young adults and adults young-at-heart. To date I have published three novels plus a selection of short stories, all of which share the same fictional universe where humanity has learned to cross the cosmos and reach the nearby stars. City Of Deceit, the latest novel in the series, wraps up the story of the civil war on the moon of Yuanshi, Epsilon Eridani, a war that formed the backdrop to events in the first book Hollow Moon. This is my first science-fiction novel set mainly on Earth; the story takes place in London, which in the twenty-third century is ravaged by rising sea levels, social inequalities and terrible politics. It’s all fiction, honest. I tend to get bits of ideas from all over the place; some might spark a train of thought that develops into a story, others may end up as background detail to fill out whatever world I’m creating. I try to credit influences where appropriate; for example, the asteroid colony ship Dandridge Cole, the ‘hollow moon’ of the novels, is named after Dandridge M Cole, the aerospace engineer and futurist who developed the concept in books like Beyond Tomorrow. A fantastic resource is the TV Tropes website, which is great for getting a feel for the nuts and bolts of different genres. I think it’s important to understand the reasons why people like stories and what they expect to get from one. On a very basic level, I try to write books I would want to read myself. I had a lot of fun writing the character of Zotz Wak, the young boy and inventor who in Hollow Moon reveals his superhero persona in an attempt to express his secret crush on heroine Ravana O’Brien. Zotz sat somewhat on the sidelines in Paw-Prints Of The Gods, so in City Of Deceit I gave him a leading role fighting the injustices of dystopian London. He gets to be the hero, fight the bad guys and even finds a girlfriend. Not a character as such, but I really don’t like the weavers, the multi-legged alien horrors that reappear in City Of Deceit. Like many I have an irrational fear of spiders, so making giant alien arachnids the number one monsters in the books seemed the obvious thing to do! On a more human note, I would have to choose Governor Jaggarneth, the slimy corporation bureaucrat who also returns in the latest book. He has no redeeming qualities whatsoever. I like to think properly about the science and technology in the books and its fun to extrapolate current thinking and imagine what this world and others might be like 250 years from now. For example, the holoverse in City Of Deceit, the corporate visual trickery behind which the real city hides, comes from current ideas on augmented reality. Then there’s things like working out which constellation Earth’s sun would appear in if viewed from a moon in Epsilon Eridani (Serpens, by the way). Research for City Of Deceit was different in that it features locations in London that many readers will know for real. I spent some time walking around central London, trying to imagine which buildings would survive the test of time and how the city might change. Victor Habbick, who created the book cover, captured this really well. Stories always carry messages; in a way, our stories define what it is to be human. The theme that emerged whilst I was writing City Of Deceit was that real change comes from within, whether it is by a virus nibbling away at cells or by human angst simmering within a city, corporation or colony. More broadly, my novels tend to revolve around working-class folk who find themselves battling the consequences of upheavals caused by those in power. The books are ultimately about friendships and how people come together in times of need. City Of Deceit is available as an ebook from most online retailers. A paperback edition will follow at some point. Hollow Moon and Paw-Prints Of The Gods are available as ebooks from all the usual websites and in paperback from Amazon. Audiobooks are a possibility sometime in the future. Yes, I edit my own work. One thing about spending years in a Civil Service policy team is that it taught me to be quite dispassionate about revising my own work. After I’ve finished the first draft of a novel, I put it to one side for a few months and immerse myself in something else, so that by the time I return to start the editing process it’s like looking at it with fresh eyes. I also have a friend who proof-reads the final manuscript, which helps. I think if an author approaches editing in the right way, you can successfully self-edit: Hollow Moon and Paw-Prints Of The Gods are both Awesome Indies approved books and passed the ‘professionally edited’ test. Can you name your favourite traditionally-published author? And your favourite indie/self-published author? This changes with the seasons. At the moment my favourite ‘traditional’ author is Alastair Reynolds and I’m currently reading his space opera epic Pushing Ice. My new favourite indie author is Emily Devenport; I’ve read two of her science-fiction novels to date – Belarus and Broken Time – which I thought had some really distinctive and original ideas. 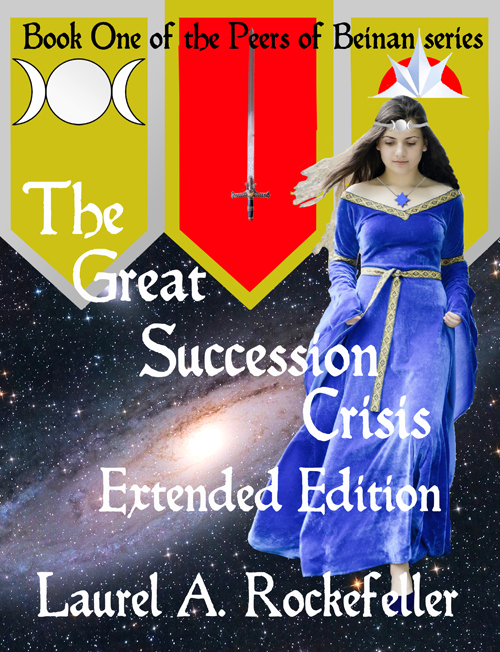 I’d also like to mention Anna Erishkigal, indie author of the very entertaining Sword of the Gods Saga, who does a sterling job looking after the Space Opera Fans group on Goodreads. Warriors from the past, present, and future fight to save us all… The IX by Andrew P, Weston. Come and meet the author today. Where are you from and where do you live now? Originally, I’m from Birmingham in the UK, although I now live on the idyllic Greek island of Kos in the Aegean Sea. Do you have a favourite character? If so why? In the IX? Yes, Captain James Houston of the 5th Cavalry Company. He’s a backstabbing swine who’d sell his own mother out to save his own skin. Characters like him allow you to play so much. There’s nothing better than getting your readers to hate someone, and then dangling them along with a carrot as the villain seems to get away with everything…Or do they? Are your characters based on real people? Because of the complicated structure of the IX, some are, especially the Special Forces unit. I based most of the fictional team members on guys I worked with whilst in the military. Research can be important in world-building, how much do you need to do for your books? Do you enjoy this aspect of creating a novel and what are your favourite resources? I had to do a massive amount of research for the IX. Remember, the inspiration was based on the 9th Legion of Rome. But, how were they structured? Who did what? How did they march, set up camp, and operate? What did they wear, and what weapons did they use. The Caledonian tribes of that time were vicious savages, and experts in jungle, warfare. However, where did they come from? How did they fight? How far would they travel to engage in combat, and what made them capable enough to defeat entire legions? The easiest part related to the Special Forces unit. For that, I drew on firsthand military knowledge and experience. Once that was done, I then had to make certain the futuristic/scientific tech referred to within the story had a basis in fact I called on my educational background in astronomy and physics for that. Even so, I still had to research the very latest developments, trends, and breakthroughs to ensure the ‘theoretical’ aspects had that ring of truth. Even though this is a science fiction novel, I wanted it to be believable. There’s no doubt in my mind that if you make things too farfetched and super-convenient, it turns readers off. Despite the work involved, I really enjoy the research aspect, as it adds a depth of authority to your work that improves quality and reading enjoyment. Is there a message conveyed within your writing? Do you feel this is important in a book? Usually? Yes, I like to convey a little message…dependent upon the subject matter. I think it makes it more personal, and helps the reader place themselves within the make-believe worlds I create. ‘be true to yourself, no matter what circumstance does to you’. See how you can spot that, as you read through the story. Do you self-edit? If so why is that the case? Do you believe a book suffers without being professionally edited? Yes, I do self edit, BUT, that’s before I send it into the publisher. I’ve been fortunate enough to work with some ‘strong’ professional editors. Each of them has a different style and personality that rings through during the formal editing stage. So, I tend to stay as ‘neutral’ as I can when I complete my own edits…to make their life easier…and then adopt the House style during the closing stages. Do you think indie/self-published authors are viewed differently to traditionally published authors? Why do you think this might be? Yes I do, because that’s the way the publishing world is geared. Certain big-name ‘Houses’ dominate the industry, and basically, hold all the cards. And as some have no doubt seen, unless you manage to secure a contract with them, you’re not viewed as having ‘arrived’, no matter how skilled you are as a writer. That’s a shame. We’ve all seen the ocean of books filling the shelves out there. Even if you’ve written an absolute masterpiece, without the clout of a massive name behind you, it can sink into the depths and will never see the light of day. Fortunately, there are a number of smaller, extremely competent publishers coming to the fore. Although they’re independent, they come from professional/recognized backgrounds, and draw quality writers to the fold. Times are changing, but slowly. What three pieces of advice would you give to new writers? Don’t give up. Work hard to improve your craft. And don’t be afraid to take risks. Most authors like to read, what have you recently finished reading? Did you enjoy it? The last book I read was “Poets in Hell”, from the “Heroes in Hell” shared world saga. A great set of stories delving into the many quirks of the Underworld. If you haven’t read it, I’d highly recommend the entire series. Can you name your favourite traditionally published author? And your favourite indie/self-published author? Traditional, it’s a tie between – Raymond E. Feist &Julian May. Indie – Laura DeLuca. Do you have a favourite movie? I think you have to go a long way to beat the sci-fi classic, Forbidden Planet. Well ahead of its time. Can you give us a silly fact about yourself? I hunt shadows in the dark with a specially designed net. As a follow up to my earlier post regarding the challenges facing readers and authors with limited vision I am delighted to post another interview with a writer of low vision. Blindness is a complex problem with no one cause or solution, but about which there is often poor understanding. People with restricted sight often suffer discrimination including the false assumption that they cannot enjoy books, cannot write or be creative and must live “a disabled life” but as these interviews show, that does not have to be the case. Hello and thanks for joining us. Please tell us a little about yourself. Hello everyone! My name is Laurel A. Rockefeller. I am author of the medieval science fiction series, The Peers of Beinan. psychology (pre-counseling), and medieval history. because of the way the bones in my skull healed together). distortions, particular with low frequency (red/orange) light. what it was before which I could not do. Please tell us a little about your books and other writing. I am the world-building author behind the medieval science fiction series, “The Peers of Beinan.” Peers of Beinan is really the convergence of my life-long passion for science and for history. religions, cultures, history, music, dancing, and heraldry. begins close-hearted; love is for commoners, NOT royalty! to embrace her heritage and become the leader she was born to be. Earth in our nuclear power plants as well). finding her father slain with five crossbow quarrels. Yes! 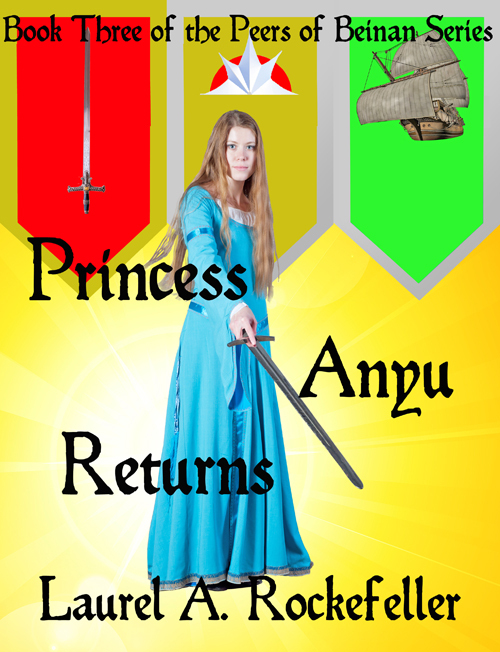 I am working on book three, Princess Anyu Returns which focuses (finally!) on Princess Anyu, the “Anlei’s Legacy” arc narrator, and her exile on D425E25 Tertius, then return to planet Beinan. I hope to release it by Christmas, 2014. In what forms are your books available? I believe you have an interactive version of your books, what inspired you to try this unusual approach? As a low vision person, I care about accessibility. So my books are in digital, paperback, QR Interactive paperback, and large print paperback formats. (companion book to all three Anlei’s Legacy arc books) in digital and paperback. to that interactive content without losing your place in the book. When did you start to write? What made you choose this genre? My “writing” began before I could read/write, actually. I grew up in an ultra-conservative, evangelical christian home where my father ruled our family with an iron fist and everyone else pretended not to notice, not even when there were obvious physical injuries. I coped with all that by making up songs and singing, then throwing myself into my studies once I was old enough to go to school. With Hyde Observatory (one of the few astronomical observatories open to the public) less than a mile from my home, I caught the astronomy and science bug really early — which was unheard of for a girl growing up at the time. This melded with my natural gift for music and language and helped me when, in 1985 I lost most of my sight in the car accident I mentioned earlier. school, I took a course called “grammar/vocabulary” in which Dr.
fiction writer, even though the format on the page is different. different from what I imagined in those first few months of writing. the genres it belongs to. Your series is based on European medieval history and people, please tell us a little more about the research involved. word), so I was always around history, especially American history. Joan of Arc — then Shakespeare and medieval music. already amassed a rich and tangible knowledge of medieval life. me — like fencing terminology or the parts of a crossbow. could describe the star craft he designed. things I do to try to adapt. television and film adaptations of whatever I’m interested in. and British, of course!) instead of trying to read them. it for hours on end. But it can be very helpful. using large print resources. On the computer, I zoom my text larger. do try to set my computer settings to display text in blue. working when my body tells me to. What are your thoughts on the choice of e-readers and apps, or lack thereof, which cater for readers with limited sight? If you own an e-reader which do you use and why? At this time, I don’t even try to use an e-reader. I won’t consider one until I have complete control over text and background color in addition to size. The current readers are black/white centric which is the worst combination for my sight. Add in the price of these devices, and they just don’t make sense for me. Glad you asked this one: first and foremost, authors need to offer their books in large print. The number of titles in large print is tiny fraction of the total. People assume that every low vision person can just use the text size option in e-readers and therefore they don’t need to accommodate sight loss directly. That is completely wrong. As, as a point of principle, I won’t patronize an author who doesn’t offer paperback and large print paperback. If you are not willing to offer your book in a format compatible with the adaptive strategies mentioned before, then I see no reason to patronize you! When reading for pleasure what format of books do you use? I rarely read for pleasure, I’m sorry to say. It is so taxing for me to read what I have to read for work that I just don’t have the strength physically to read for fun that much. Usually if I want to read for fun, I download an audio book from my library for the blind. Do you think the choice of books for low vision readers is limited? Has the choice increased in recent years especially with the rise of e-readers and audio books? Oh absolutely. Most low vision and blind folks use large print and audio editions. I estimate that fewer than 25% of all books are available in either of these. No clue about the actual numbers, but that is my perception, especially after interviewing authors for my own blog. What would you suggest publishing companies (such as Amazon and Smashwords) do to increase their choice and marketing of such books/devices? First, Amazon needs to list the large print options with the regular editions. Type in any of my book titles and you WON’T see there is a large print version available on Amazon, even though my books ARE in large print. Instead, you have to type in “large print” in your search inquiry on Amazon; mine are not even listed on my author page! The only way to get to them, believe it or not, is to use the direct link on my website! to deal with — another reason I do not have a smart phone! Number one: listen to your body when it comes to how you feel. If something feels wrong, even just fatigue, DON’T PUSH IT! If you are not healthy, any remaining sight you have diminishes. That really goes for everyone. Your visual system is very complex and sometimes fragile, so be mindful and be a good steward to yourself. more than you think there are — but don’t be limited to them either. The most effective adaptive strategies I have are also the cheapest! Ariel 10 in black, then I’m hurting myself trying to use that content. certain age WILL lose eyesight one way or another! can do a lot more about it than I as an individual can alone. It starts with being mindful. strategies are shared across many people. you can make a difference here by your choices in books and devices. Where to find Laurel’s books find links to the songs, the unique heraldry and other features and the rich history of the characters, plus author interviews etc. For the data files please visit the book site. 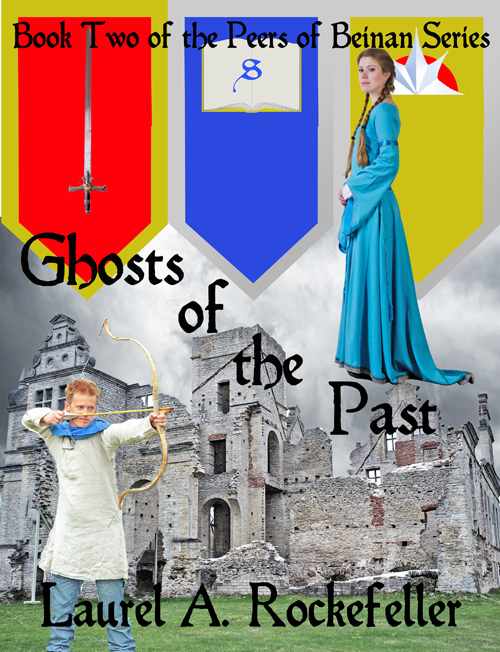 https://www.createspace.com/4375671 Ghosts of the Past QR interactive. BorderStone Press on April 29. Please tell us a little about your writing – for example genre, title, etc. The Quest of the Unaligned blends science fiction and fantasy into a unique, page-turning adventure. The story follows Alaric, a security chief from a technologically advanced city where hover-cars zip over anonymous crowds, contracts are king, and education is everything. perilous adventure that will force him to confront a seemingly impossible truth and embrace his destiny, even as the fate of Cadaeren hangs in the balance. Where can readers find your book? The Quest of the Unaligned will be available for purchase on amazon.com and select other retailers. How long have you been writing and what, if anything, made you choose the genre in which you write? I have been writing fantasy and sci-fi stories since grade school, and before that, I would make up and retell fairy tales to my friends and family as often as they would listen. I have always loved creating new worlds and cultures, and exploring what would happen if the world were slightly (or incredibly) different in some way. For instance, in The Quest of the Unaligned, I explore what it would be like for a super-rational individual who believes in the power of education and training and science to be forced to survive in a world where magic is real, and where one’s life-course is determined by birth rather than by ability. Who or what are your inspirations/influences? While I have enjoyed the works of literally hundreds of different authors, I would say that the fantasy authors who have inspired and influenced me the most are JRR Tolkien, CS Lewis, JK Rowling, and David Eddings. Tolkien, through his masterful world creation and use of language; Lewis, through his communication of truths about humanity through a fictional setting; Rowling, through her humor, inventiveness, and YA appeal; and Eddings, for his characters, cultures, and epic quest plots. Negative: Sitting in front of a blank computer screen, trying for the seventy-fifth (or hundred and seventy-fifth) time to find exactly the right turn of phrase for expressing the idea in my head. A few times, I have had to spend literally hours on a single sentence, before I found a way to make it sound right. Fortunately, that doesn’t happen too often. With the rise of e-books do you still publish in print as well? Is this medium important and why? The print medium is definitely still important, and I certainly will always want to publish my work in print. While e-books are convenient, there’s nothing like turning physical pages in a book. They also feel good in your hands, you can skim through them or flip back and forth between sections, and you never have to turn them off on an airplane! Do you listen to music or watch TV whilst you write? I know that a lot of people are able to listen to music or even watch TV while they write, but I get distracted far too easily to be able to do that. If I had my choice, I would have it completely silent when I write. Silence allows me to concentrate on the scene I’m writing, hear myself think, and find the best words for what I want to say. instance, which are purely visual (and possibly tactile), novels engage the reader’s imagination. In addition to watching action scenes play out in their minds (which, when written well, can rival the best video game sequences ever made), readers can also delight in the beauty of a turn of phrase or eloquent description, and can explore the unique mental processes that lead a character to act or to speak. By reading a novel, a person can feel like they get to know a character the way they know a friend or family member – something that is far more difficult to do in a non-literary medium. I don’t remember when I started writing, but it was quite young. Probably around nine or ten. The first stories I wrote were, naturally, very short and very bad. There was a definite transition to slightly more properly written stories, but these early ones were still fairly nonsensical and are embarrassing to re-read now. In 2001 I moved from England to Ireland. There was a blissful period where a school couldn’t be found for me (probably about three or four weeks, but it felt like months), but my computer was in storage and I didn’t really write much. Then came school, and thus depression, and I wrote nothing at all. Eventually I resigned to my doom and when we moved into a proper home (instead of staying with family) and I got my computer back, I started writing again. The first thing I started writing was a thriller of some kind. I don’t know if I recognised it then, but it was the first ‘proper’ thing I’d written. It had a proper story, deeper characters, twists and some mystery. Then the file was somehow corrupted and I lost it. The most intelligent and well thought out development I’d ever written was completely gone, and to this day I have no clue what it was. Luckily, I’d been sending updates to my grandfather, and although I hadn’t sent anything for some time, I still have a good chunk of it that he printed out. Some day I’ll go back to it. After allowing that loss to prevent any writing for a while, I eventually went back to something I’d started just before I left England. It was a story about humans leaving Earth to find a new home. Then I decided that was boring. So I deleted the whole thing and started again, and it eventually became Shadow of the Wraith. Also, I have a wisdom tooth cutting into my cheek a bit, but I’m not sure that’s relevant. Please tell us a little about your writing – for example genre, title, etc. I mainly write science fiction. More specifically, science fantasy. Science fantasy is where the science part is really just a veneer. Where the impossible is made to look probable. It generally asks the reader to suspend disbelief a little more than hard sci fi. In much the same way you’d find it in yourself to not take issue with a tiny man taking a sentient ring that makes him invisible into the middle of a volcano before a giant floating eyeball sees it. Mostly, I like to say to people that my writing is whatever I want it to be about, and it just happens to be set in space, in the future. As for titles, I have two novels of my science fantasy series, NEXUS, published. They are ‘Shadow of the Wraith’ and ‘Temple of the Sixth’. Yes, I somehow seem to have made the unconscious decision to call all the books in the series something of the something. No, I don’t know why. It could become complicated. I also published a steampunk short story, Kira. Where can readers find your book? They are all available on Amazon (UK – http://www.amazon.co.uk/Ross-Harrison/e/B007ZSUY06/ and US – http://www.amazon.com/Ross-Harrison/e/B007ZSUY06/) and Smashwords (https://www.smashwords.com/profile/view/ShadowOfOsiris). The e-books can be found in various other places, like Barnes & Noble, Sony’s bookstore, iTunes, and so on. How long have you been writing and what, if anything, made you choose the genre in which you write? As I said, I think I must have started around nine or ten. Although I think I made up some very short things before that. I don’t think anything made me choose sci fi particularly. I just like the freedom and the possibilities. Who or what are your inspirations/influences? I have no idea. I write like me, and I write my own stuff. I have no desire to write like anyone else, and I never think ‘I like that, I’ll use it’ when I read or watch something. But we’re all naturally influenced by everything around us. Can you name a positive experience from your writing and a negative one? The first positive thing that comes to mind at the moment is when I got my first review for my first novel. It was very nerve-wracking waiting for the result. But then came a five-star rating and favourable review. Then the next was another five-star review, in which the reviewer actually referred to herself as a fan-girl (having never previously liked sci fi). More positive ones followed soon after, and it made me feel very good about my writing. A stand-out negative experience would be when I paid a considerable amount of money for a science fiction author to read and assess my novel. It was quite a disaster. He wrote a pretty long assessment, but seemed to completely miss the fact that it was science fantasy, not hard sci fi like his own writing. He brought up literally one or two relevant and useful points, and the rest was completely non-relevant. So that was an unpleasant experience. Of course, you’ve got to be aware of the line between someone ‘not getting’ your work and it just being plain bad, and they see that but you don’t. It’s a hard line to spot, but a writer has to keep their eye on it. With the rise of e-books do you still publish in print as well? Is this medium important and why? Yes, both novels are available in paperback (and a special edition hardback in the case of Shadow of the Wraith). I can’t imagine having a novel in only digital form. I’ve bought a few e-books, but I’d much rather read a proper paper book, and so I’d never neglect a printed edition of my own. I’m not sure I could really put my finger on why it’s an important medium, but I certainly dislike the idea of everything going digital. There’s a definite difference between holding an e-reader and holding a book, flicking through real pages. It would be a shame to lose that. Do you listen to music or watch TV whilst you write? I used to listen to music while I was writing (mostly Queen), but I found it was influencing my writing too much. If it was a fast song or piece of music that I could envision playing during an action sequence in a film, or the end credits, I found myself writing my scene faster and in a more cinematic way. Which doesn’t really work. So these days, I don’t listen to anything. I certainly don’t watch TV – I’d just forget to write. Books are important, why is this the case? What can a book provide that say a video game cannot? As someone who plays games, this isn’t an easy question. I suppose on a more technical, ‘boring’ level, there’s the fact that you always come across a new word when reading a book. Or a word you’ve heard used, but now you see it you’ll take the time to look it up. Reading a book gives your imagination some exercise, too. You only have the words, so you have to let them paint a picture in your head. You have to take the description of a character, and decide just how to put that together into something you like the look of (or don’t, perhaps). Of course, the drawback of this is if the writer hasn’t described something particularly well or thoroughly, your mind is blank. Then it’s just words. The kind of thing that most people think of when they think ‘video game’ is something like Call of Duty. That’s a title that even your grandparents are likely to have heard at some point. Those who know nothing about games seem to assume that they’re all like that one: shoot everything that moves for five or six hours. What they don’t realise is that there are plenty (though not enough) of games that are completely story-driven, and extremely well written. I’ve played games that have had a story that equals any book I’ve read in terms of depth, intrigue, emotion, etc. What these games have that books don’t is interaction. The ability to mould the character, and affect other characters, and the story itself. Of course there are those old role playing adventure books: ‘An arrow bites into the wall beside you. Go to page 16 if you want to chase them. Go to page 8 if you want to run screaming like a little girl. Oh dear, you have an arrow in your eye and are rather dead.’ I’m sure these still exist, but it’s not quite the same thing. So it’s a difficult question. I wrote a blog post about how games need to move towards this kind of writing and storytelling in the next generation (Playstation 4, etc), but unless they do, then books will always hold the crown for meaningful, moving storytelling. Can you give us a silly fact about yourself? If someone put me in a helicopter with the engine running, I can fly it. But I don’t know how to start it.